When Snap made headlines last year for surpassing Facebook’s video viewership its achievement of the 10-billion-video-views-per-day milestone underscored not only Snap’s staying power, but the growing importance of video to social media. Increasingly video is being consumed over social networks. To wit, social platforms like Twitter, Facebook and Snap are all making big bets on video. Twitter’s acquisition of Periscope, Facebook’s launch of Facebook Live as well as 360-degree video is only a few of the first moves in what will be a new era of video. What will be interesting to see is if this is a winner-takes-all match, or one where each of the players decides to own a different corner of the ring. Let’s look at three different dimensions of the interplay of video and social media: how it’s consumed, how it’s distributed and how it’s monetized. When Snapchat reached 10 billion daily video views in April of last year, it had quintupled the number in less than year, growing from only 2 billion views the previous March. Twitter saw video consumption on the platform grow 220x in the 12 months between May 2015 and May 2016. In November 2015, Facebook announced it was seeing 8 billion average daily video views from 500 million users. That was up from 4 billion video views per day only eight months prior. One company looking closely at how to integrate video into its experience is Pinterest. “Video on Pinterest is actionable because it can be paired with other Pins, helping the user go from inspiration to action. A user can watch a video of a makeup brand showcased on Pinterest and be able to take further action on it by buying the product, or finding out how other users are applying it, and so on” said Mike Bidgoli, Head of New Ad Products at Pinterest. Some 55% of Pinterest users are there to find or shop for products according to Mary Meeker’s latest internet trends. “We think of Pins and boards as LEGO blocks. They can be put together to convey rich ideas. Video is an important LEGO block that combined with the other blocks can not only inspire users, but also enable them to take action,” says Bidgoli. One of the big technical challenges is understanding how best to identifying the component parts of a video. As Bidgoli puts it “understanding the content inside of a video is a meaty computer science problem.” We at Videogram agree! Our approach is to leverage machine learning to break videos down into their atomic elements thereby enabling both publishers and users to pin specific points in videos that are of particular interest and consume them in the most useful or enjoyable way possible. We think of personalization today as a search recommendation or a pleasant welcome screen. But hold on to your chapeau, we’re on the cusp of a quantum leap in personalization. Let’s take a simple example: a movie trailer. In the future, there won’t be one trailer for everyone, there will be one trailer for you! A person with a certain social profile might see the car chase and helicopter rescue, while another might see the love scene and sunset. The content will look at you and form itself to your personality. This kind of personalization will then compel distribution. Users will pluck the parts they want to share and promote them on social media. Their connections will then have a tailor-made experience and do the same. Viral 1.0 was a single virus. Viral 2.0 is a virus that mutates as its spreads! The current state of the art for many publishers is creating shorter and shorter forms of content. Here at Videogram we see this approach is a race to the bottom, as the content itself loses context and relevance. Shorter-and-shorter-form content is just a bandaid over the technological limitations of current platforms for enabling user-directed consumption and distribution. What are needed are solutions (like ours) that enable users to share specific parts of a video, while maintaining the integrity of the content as a whole. Essentially enabling sub-experiences and offshoot conversations. These kinds of capabilities create both higher engagement and increased distribution. The pre-roll is dead, long live the pre-roll! A single ad placed at the start of a single, long, video will always struggle to capture the attention of the consumer. However, rather than thinking of a video as an asset with only one advertisable moment – it’s start – what if a video is instead a treasure trove consisting of any number of opportunities for monetization? The greater the relevance to the consumer, the more likely they are to consume the companion advertiser media. As such a part of a video shared in the flow of a vibrant discussion, or in the context of a greater overarching experience is going to be a much more compelling conveyance for advertising. Further, if the users in in control of an experience tailored to them, they will likely be much more receptive to receiving a greater number of advertisements as they hop from relevant content to relevant content. In short, give the user what they want, and they will pay you for the favor. The platforms that figure this out first will be big winners. Ad dollars are moving from TV to digital video, fast. According to a report from eMarketer in June of 2016, digital video ad spending in the U.S. is expected to be in the double digits until the end of the decade, more than doubling from $7.66 billion in 2015 to $16.68 billion in 2020. At the same time, ad spending on TV will grow by no more than 2.5 percent in those same years. Digital video ad spending won’t catch up to TV ad spending any time soon, as those numbers will be over $70 billion annually, quadruple the amount spent on digital video, but the gap is closing. In 2014, TV ad spending was over 1,200 percent more than digital; in 2020, it will be 362 percent higher. It was recently reported that Facebook is going to be testing mid-video ad rolls on videos that are at least 90 seconds long. A user has to watch a minimum of 20 seconds to be shown an ad, and Facebook is capping ad length at 15 seconds. The company began testing mid-roll ads in live videos last August. Simple gamification models like receiving rewards for actions (think getting a free song on iTunes for sharing a clip) will probably be the first wave of innovation, but the potential models and combinations are endless and are an area we’re actively exploring at Videogram. Video has historically been big, bulky and unwieldy. It’s the oil tanker of content – able to deliver a huge cargo, but unable to turn on a dime. That’s all about to change. As consumers demand flexibility, publishers, advertisers and technology enablers will race to find ways to meet the need. Social media will be the venue of these changes. It will be where consumption and distribution blend together, and where new forms of monetization will emerge. The winners will be the ones able to adapt the fastest to rapidly changing consumer demands. 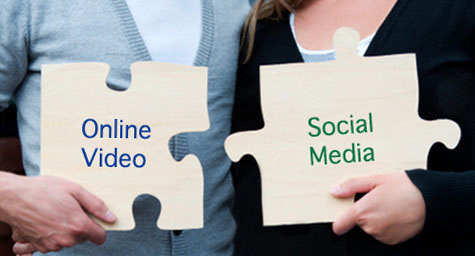 Social video will be flexibile video.